The 2019 Mercedes-Benz GLCe is a compact luxury SUV that became the automaker’s second plug-in-hybrid crossover and one of many more electrified models on the way. It first appeared as a 2018 model. 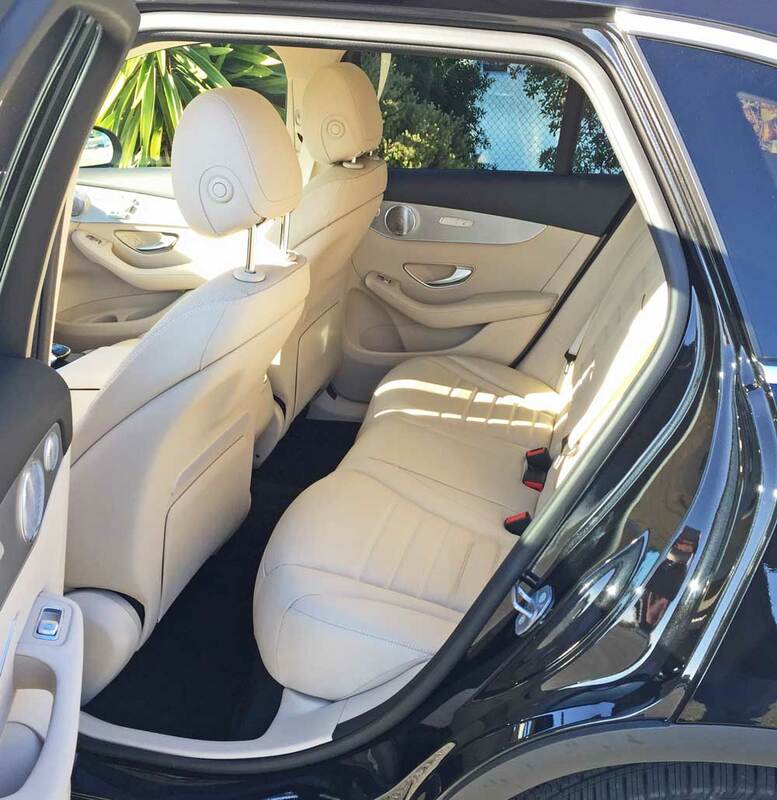 The GLC 350e is a Plug-in Electric Hybrid (PHEV) that accommodates up to five occupants. It is powered by a Hybrid 2.0-liter inline 4-cylinder turbocharged Gas engine with an 85 kW electric motor and Haptic accelerator pedal providing intelligent use of electric power. 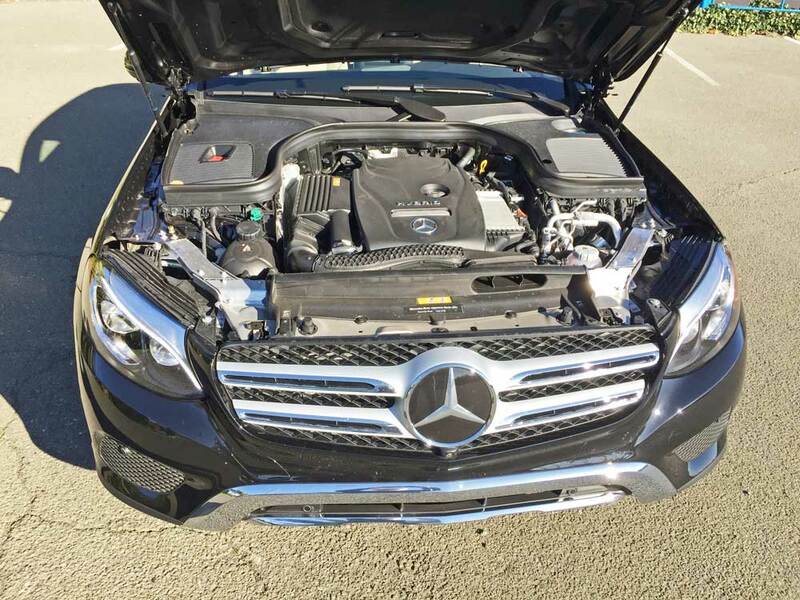 The GLC 350e’s combined horsepower is rated at 320, and the combined torque measures 413 pound feet of torque. Performance oriented versions are offered as the AMG GLC 43 with a 362-hp, twin-turbo 3.0-liter V-6 and AMG GLC 63 with a 469-hp, twin-turbo 4.0-liter V-8. Towing capacity is 3,900 ponds when properly equipped. The hybrid system’s motive force is geared via a 7G-TRONIC seven-speed automatic transmission with overdrive and paddle shifters to either the rear wheels or Mercedes’ 4MATIC permanent All-Wheel Drive system with Dynamic Select featuring a four mode drive selector and multiple ways to recharge. 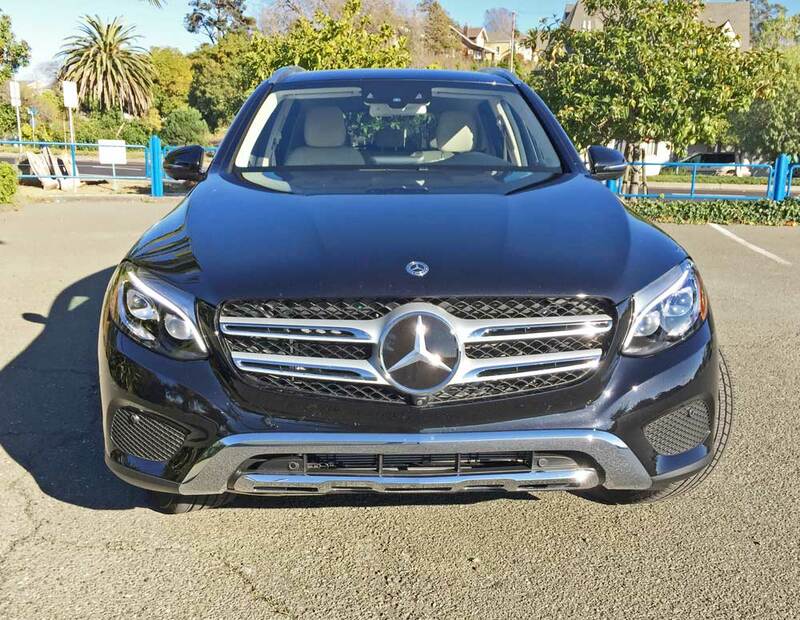 The latest iteration GLC 350e displays the image of a coupe like body style that leads off with a bold, expressive front end featuring a horizontal two bar grille anchored by a large, circular three-pointed star logo and flanked by “cat’s-eye” headlamps. The roofline slopes gracefully rearward over the rear doors, and angles down over the short rear-end. Both front and rear overhangs are abbreviated and emphasize the GLCe’s low, aerodynamic stance. Competitors in the in the compact SUV class include Audi’s Q5, BMW’s X3, the Lexus NX and the Porsche Macan. 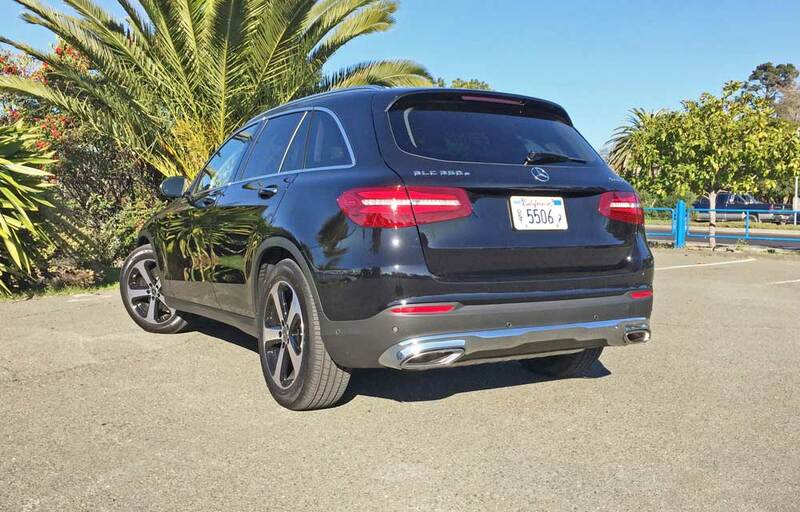 Pricing starts at $50,650, which represents nearly an $8,000 premium over a comparable GLC300 4Matic, but the blow can be softened with a federal tax credit of almost $4,500., and even more by some regional and local credits. The EPA combined mileage estimates for fuel economy is 56 MPGe with a combined range of roughly 350 miles. Gasoline only yields 25 MPG. The electric only range is up to 9 miles. Charging time is 1.9 hours at 240V. The “e” could be construed as being for “extra” horsepower and torque over the GLC 300. Or, some may interpret it as standing for stands for “elimination”. 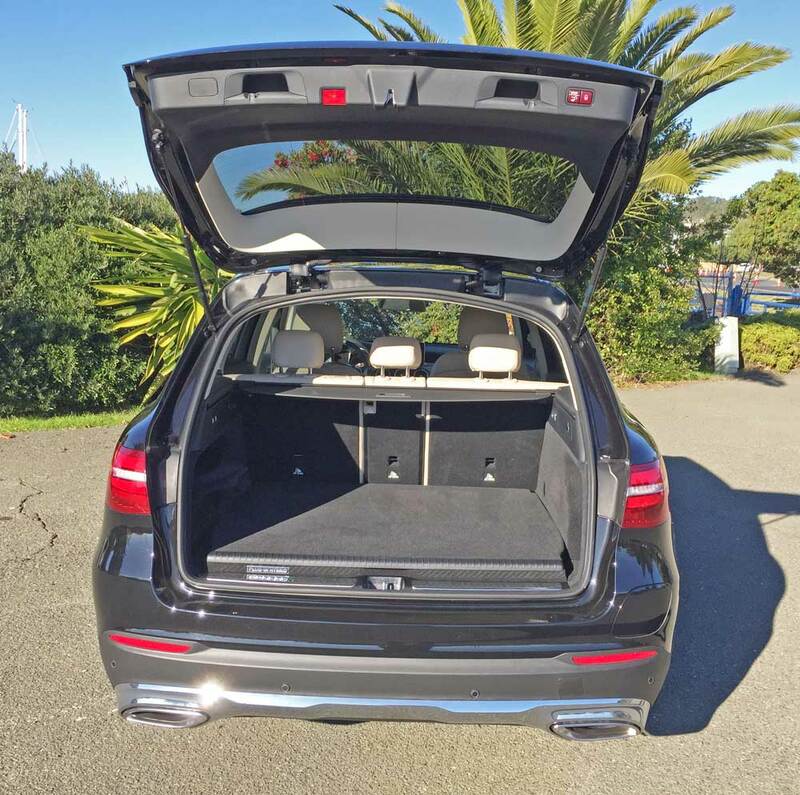 This GLC 350e surrenders 5.5 cubic feet of luggage space, drops 4.2 gallons of fuel capacity, and eliminates two gears from the GLC300’s nine-speed automatic. 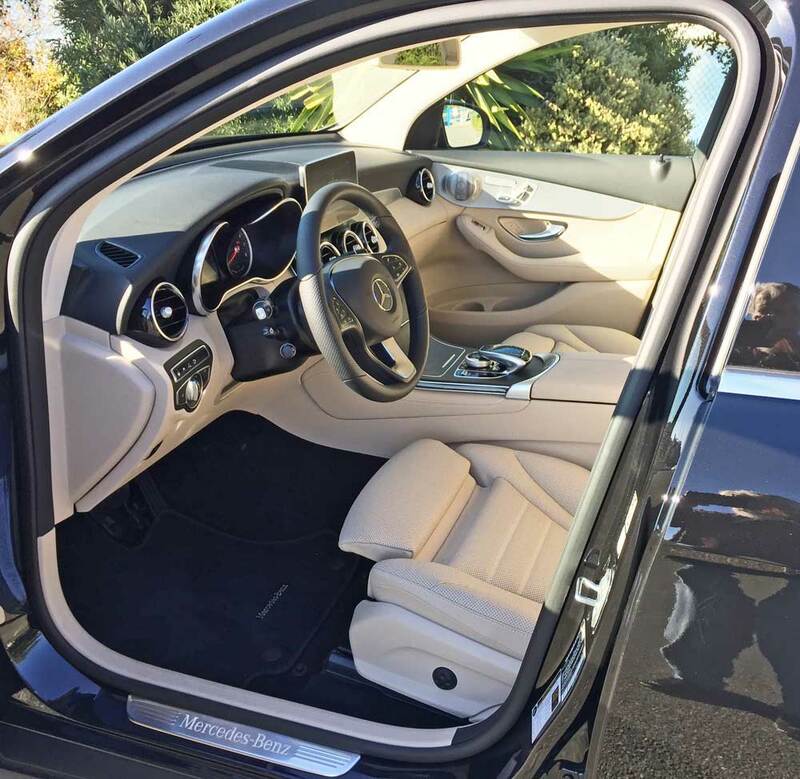 My test 2019 Mercedes-Benz GLC 350e 4MATIC came with an Obsidian Black metallic exterior finish and sported an interior executed in a combination of Silk Beige and Black leather, with natural grain Black Ash wood trim elements, a Porcelain headliner and aluminum door trim accents. The base price was set at $50,650., while the addition of optional equipment and value added packages as well as the Destination and Delivery charge elevated the final count and amount to $68,145. Optional fare was both extensive and impressive. Driving this new Mercedes-Benz PHEV is both pleasant and rewarding. It’s a little different from some other PHEV vehicles. 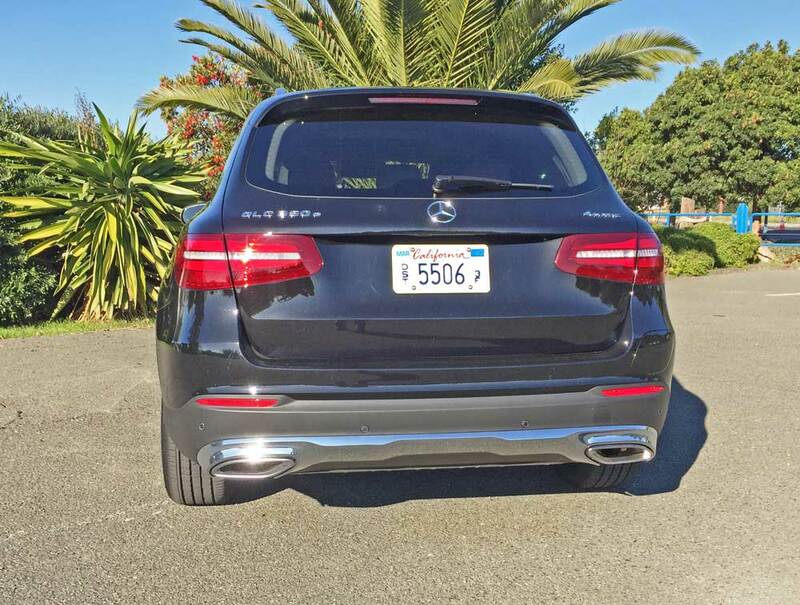 MBZ folks estimate that the GLC 350e is 0.2 seconds quicker fro 0-60 mph than the GLC 300 4MATIC. 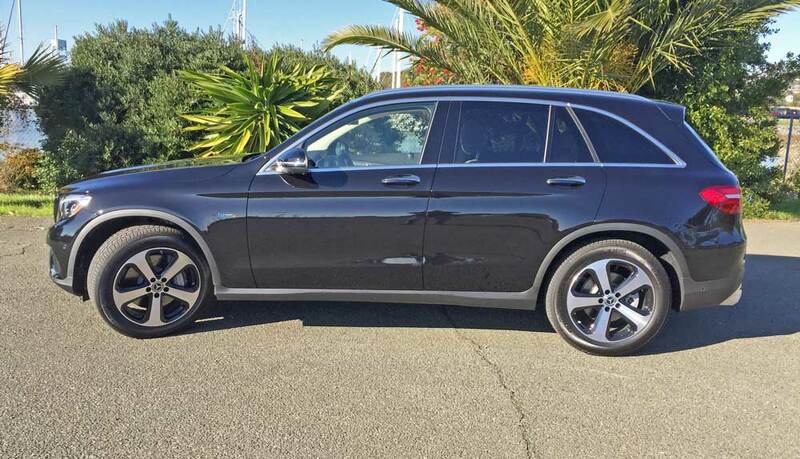 Using only the electric motor, the GLC350e generates 251 lb-ft of torque and is capable of a top speed of 87-mph. The ride quality rates high on the comfort scale, and the interior ambience is top notch, with intuitive switchgear and controls. Safety equipment, connectivity and infotainment are representative of what one expects from a Mercedes. Experimenting with the four driving modes results in altering the mix of the powertrain’s electric and gas/electric driving. The standard Hybrid mode is self explanatory. E-Mode supplies power exclusively by the electric motor. The remaining two modes, E-Save and Charge, keep only the gas engine running allowing the driver to conserve battery power for later use, while the Charge mode replenishes the battery while under way. Other adjustable settings include: Individual, Sport +, Sport, Comfort and Eco. The “haptic accelerator pedal” applies counter-pressure to the driver’s foot, similar to Infiniti’s “eco pedal”, encouraging softer acceleration. In the GLC 350e, the pedal resists downward motion to the specific point where the vehicle can maintain electric operation. Pushing harder, the gas engine fires up for added power. Via two pulsing sensations, the pedal also indicates when one can ease off the throttle to save fuel while maintaining an existing speed. The Regenerative braking rate changes depending on the vehicle ahead, using the GLC’s forward-looking radar to alter the engine braking. This Hybrid Mercedes accelerates quickly (unless you happen to be in E-Save mode) and the instant torque of the electric assist eliminates any turbo lag. On the other hand, the extra weight is a factor, and the GLC 350e is not as athletic and responsive as its gas sibling. Does the GLC 350e 4MATIC make economic sense? It’s expensive, and presents an alluring style, and affords one membership into the “Green Machine Club”. The big consideration is how much are you willing to pay for the Green status of electrification? Engine Type and Size: Hybrid 2.0-liter inline 4-cylinder turbocharged Gas engine with 85 kW electric motor and Haptic accelerator pedal and intelligent use of electric power. Transmission: 7G-TRONIC seven-speed automatic with overdrive and paddle shifters. Drive Train: Front-mounted engine / 4MATIC permanent All-Wheel Drive with Dynamic Select featuring four mode drive selector and multiple ways to recharge. Brakes: Power-assisted four-wheel discs with radar-based Regenerative Braking System, ABS, BA and ESC.Torque Vectoring and Sport Brake System. 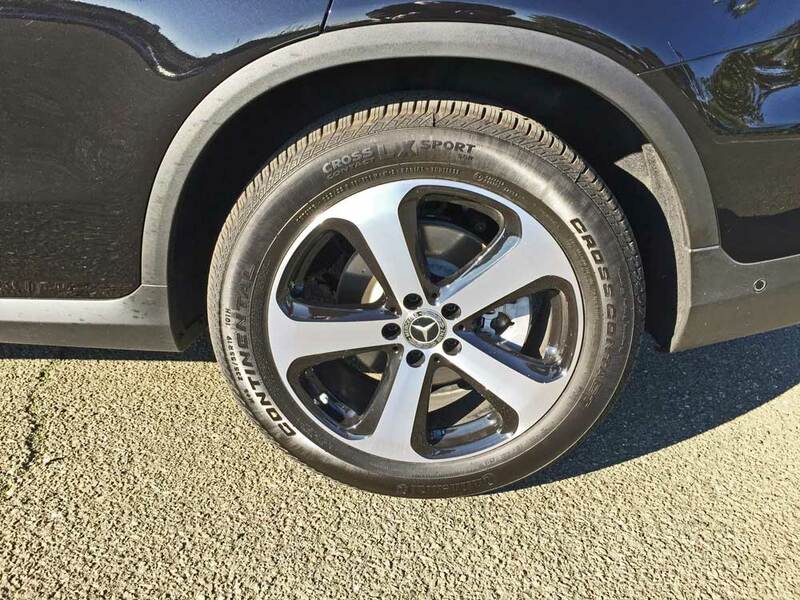 Tires: Continental CrossContact LX Sport 235/55 R19 -101H M&S mounted on 5-anvil- spoke machine face alloy wheels with painted inners. Fuel Capacity: 13.2 gallons – approx.